Georges River Land Trust will host Penobscot Bay Regional Chamber of Commerce’s Business After Hours event on Wednesday, September 12 from 5 to 7 pm at Langlais Sculpture Preserve in Cushing, just 3 miles down the peninsula from the Maine State Prison Showroom in Thomaston. Parking is limited and guests are encouraged to carpool. Business After Hours is the area’s premier networking event for business professionals, creating the opportunity to discuss and share ideas while learning about other local businesses and organizations, upcoming events, and other timely Chamber news. It is a relationship-building experience held in a relaxed setting that benefits everyone who attends. 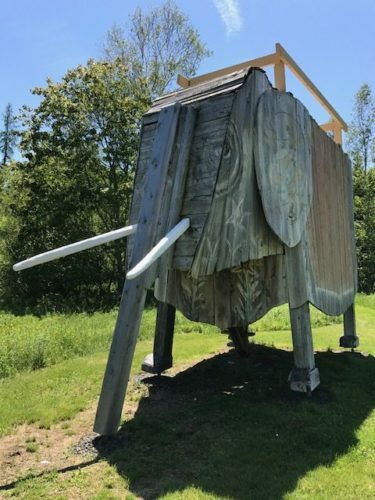 Langlais Sculpture Preserve, the former homestead of Bernard “Blackie” Langlais and his wife Helen, was gifted to the Land Trust by Colby College Museum of Art and the Kohler Foundation in 2015, along with a sizeable collection of paintings and sculptures, including the many larger-than-life creations permanently displayed on the 90-acre property. Chamber members are encouraged to stroll through the sculpture garden upon arrival. Niki Janczura, Business Development Officer at First Advisors, and volunteer chair of the Langlais September 12th event committee, is working with Georges River Land Trust staff to provide an engaging program and seasonal refreshments. Entertainment will be provided by cellist Robin Lane of Midcoast Music Academy.